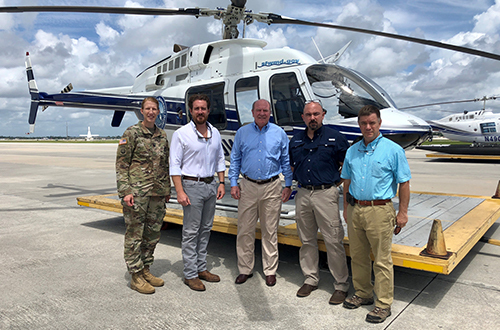 West Palm Beach, FL – South Florida Water Management District (SFWMD) Governing Board Chairman Federico Fernandez and Executive Director Ernie Marks joined the Assistant Secretary of the Army for Civil Works R.D. James yesterday to highlight some of the major Everglades restoration projects targeted at reducing Lake Okeechobee discharges to the northern estuaries. Additional participants included U.S. Army Corps of Engineers (USACE) South Atlantic Division Director of Programs Alvin Lee and USACE Lt. Col. Jennifer Reynolds, the Deputy District Commander for South Florida. "The Assistant Secretary and Army Corps are committed, just as we are at SFWMD, to getting these major projects approved, funded and built to realize their benefits for the Everglades and citizens of the state of Florida," said SFWMD Governing Board Chairman Federico Fernandez. "We are grateful to him for his time here in South Florida to see what is being done to address the current high water emergency and ultimately get the water right with these restoration projects. This Board believes in this crucial partnership and invites Secretary James or any other member of the Army Corps or other involved federal agencies for future opportunities to see how these massive projects beneficially impact the lives of South Floridians." C-44 Reservoir and Stormwater Treatment Area (STA) in Martin County. SFWMD expects to finish building the STA by next year and USACE expects to complete the reservoir by 2020. The reservoir and STA will store and treat 50,000 acre-feet of local basin runoff, reducing freshwater flows to the St. Lucie Estuary and improving water quality. Caloosahatchee (C-43) West Basin Storage Reservoir, which is scheduled to be completed in 2022. This reservoir will have the capacity to store 170,000 acre-feet of water, or 55 billion gallons, to reduce estuary releases during the wet season and provide fresh water that the estuary needs during the dry season. Kissimmee River Restoration Project, which the USACE expects to complete by 2020. This project restores more than 40 square miles of the river and its floodplain, including 20,000 acres of wetlands and 44 miles of historic river channel. It will restore the historic flow pattern to a large portion of the river, help slow down the flow of water to Lake Okeechobee and improve habitat for hundreds of species of birds, fish and other wildlife. Everglades Agricultural Area (EAA) Storage Reservoir, which would store 240,000 acre-feet of water and treat it to meet stringent state water quality standards before it flows south to the Everglades. The EAA Storage Reservoir is currently awaiting authorization from Congress as part of the Water Resources Development Act of 2018. Caulkins Water Farm, which is a public-private partnership between SFWMD and the Caulkins Citrus Company. The project, built on a 3,200-acre former citrus grove in western Martin County, stores stormwater runoff from the C-44 Canal that would otherwise flow into the St. Lucie Estuary.